PROJECT SUMMARY: This home and property sit on one of the most desirable lots on the edge of Greensboro National Golf Course overlooking the vast greens and beautiful skylines. This is such a beautiful and unique home that once served as a hunting lodge and has now been completely renovated and updated to reflect today’s standards. Lots of open space, large trees, and beautiful wood work surround this home. Being on several acres and off the beaten path is delightful for feeling in touch with nature and secluded from neighborhoods, but quickly brought to the light, the need for accent lighting. Phase I, included illuminating the front of the home’s architecture. The goal was to properly illuminate the front elevation of the home and add onto the system down the road. Once our clients experience great outdoor custom accent lighting, the need to expand throughout the property is inevitable. LANDSCAPE LIGHTING FOCUS: Since phase I only included accent lighting on the home, so we needed to make a statement with it. The focus was simple, light the home simply without over-lighting or under-lighting. Like many things there is a right and a wrong way of doing things. Lighting is no different. Although many of the homes you pass in the Greensboro National neighborhood already have landscape lighting, the attention and focus of the landscape lighting isn’t always accurate or well designed for maximum impact. Improper lighting and placement of fixtures can bring attention to an area where lower level lighting is required or bring your eye to an area that takes away from the overall lighting design. Our landscape lighting design focus was to capture the full architectural elements of the front of this home, helping it to standout at night, but also providing a sense of balance. Highlighting the eaves and soffits properly was important on this home to capture the detail of the home. A new sense of security was added to this beautiful home by simply illuminating the area with accent lighting, and allowing the home to actually help reflect lighting into the natural area and walkway. This technique helps to keep the lighting design looking natural and not feeling overdone with a sea of path lights along a walkway. Feeling secure after hours without the need to blast floodlights all the time was important to this couple. 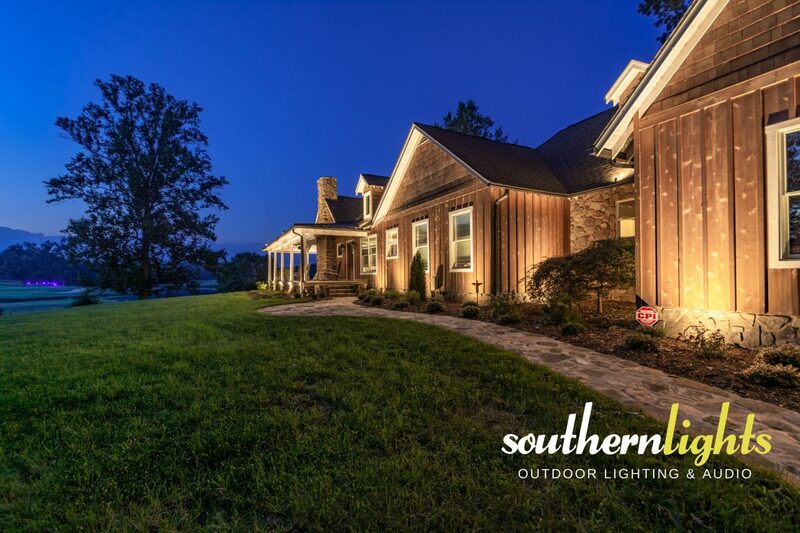 Southern Lights was able to provide both the security the owner’s needed to feel on their property, and the serenity desired for a subtle accent lighting on the front of this home’s facade. LOCATION: This custom accent lighting design and installation can be found off the beaten path in the Greensboro National Golf Course neighborhood, Summerfield, NC 27358. LANDSCAPE LIGHTING DESIGN: Ideal landscape lighting should evoke Safety. Security. SERENITY and should always start with a design. A custom built home, needs a custom landscape lighting design and installation. This home is on a very deep lot which means there is a very long driveway, so as you turn onto the driveway, this beautiful home is glowing in the distance as you make your way down the driveway. This landscape lighting system has been designed to be able to be expanded. There is much to expand upon here with enormous large Oak trees lining the driveway as well as the wood line. Our lighting design goal was simplicity. Clean lines. Accented eaves and soffits. This home needed to stand out in the distance among the large open areas leading up to the home’s front entrance, so proper care was given to provide the proper wattage, beam angle, and placement of each fixture to capture the detail in the wood work, front porch, walkway, and new plantings. This particular lighting project did not have a large amount of hurdles or complications to overcome, but the dormers, fireplace, and upper eaves of the home required a custom fixture mount in order to install fixtures in the right location to accent the full detail that continued after the first floor lighting. This client ultimately trusted Southern Lights with the lighting designs allowing us to provide them with the most ideal landscape lighting effect with the best lighting fixtures for the space and structures. We think it turned out pretty awesome!